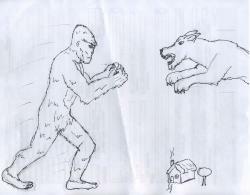 Bigfoot vs. Werewolf: Who will win the war of the monsters? The titans close on each other: Look at how much bigger they are than that house! But how do we know that's a werewolf and not just a normal giant wolf?Courtesy JGordonJK. 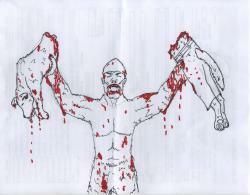 The war has already been fought, Bigfoot totally won, you missed it, and remarkably little blood was spilled. Go figure. See, everybody has to be afraid of something, pretty much. And for a long time we were all, “I have to be afraid of something, huh? Well… I’m already sort of afraid of wolves, so why don’t we throw in this unnatural wolf/man mix thingy. I’ll be afraid of that.” And because we were too dumb to know about stuff like flesh eating disease and giant crocodiles and cancer, we were pretty satisfied being afraid of werewolves. Science gave the supernatural a little boost of legitimacy, in a roundabout way. And at the cost of poor, dear wolf-man. Or so says Brian Regal. Take it for what it’s worth; he’s an assistant professor, after all. I don’t trust assistant anythings. Especially not dental assistants. Regal will be presenting his theory to the British Society for the History of Science in Leicester, UK in July. He’s going to show how period artwork also reflects this werewolf to Bigfoot transition, which sounds pretty neat. So if you can make it to Leicester and into the British Society for the History of Science sometime in the next month, maybe you should check it out. A brutal win! : Look—the wolf has pants. Case closed. Oh, right... this drawing isn't appropriate for more delicate viewers.Courtesy JGordonI’m more than a little disappointed in the lack of an epic, bloody monster-on-monster battle here, though. So I’ll be drawing one for y’all just now, on the back of some paper I pulled out of my trash. In Russia, yeti hunts for you! I've spent years building this search program: Hopefully I'll have a color version someday.Courtesy JGordonHere at Science Buzz, we deal in facts. Cold, hard, frosty, refreshing facts. Before we send anything out to you, the Buzzketeer, we subject it to rigorous testing. Like, hey, here’s a cool idea for a post. Is it unequivocal, objective fact? No? Then we throw it out. That’s just the way we operate here. You deserve it. So, hey, check this out: there might be yetis in Siberia. 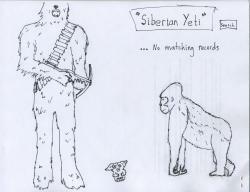 Yes sir, the search is on for yetis in Siberia, in a region where yeti sightings have skyrocketed in the last few weeks. While folks in the area claim to have been seeing upright, hairy creatures for years, 10 sightings in the past few weeks have got people concerned. Concerned and excited. Local officials have launched a yeti-finding expedition, which has so far found approximately zero yetis, but has discovered an intriguing footprint in a nearby cave. (Images of the footprint can be found at the link to Cryptomundo above). Despite my dedication to cryptozoology and the cryptocouch, I’m not sure that departmental petty cash is going to get me to Siberia to verify anything for y’all. So I must remain here, on the cryptocouch, doing what I can with what I’ve got. And that’s not much. Still, reports have the creatures at about six-feet-tall, with red and black fur. I ran this description through my visual yeti database (see associated image), and I can conclusively say that we’re dealing with a heretofore-undocumented variety of yeti. This might not seem like a very significant thing, but it’s important in science to understand what you aren’t dealing with. Then you can move on to what you might be dealing with. And that’s where we’re at now. Which is the real gnome? : I'm not sure, but I'll tell you how to find out: hit each one with an aluminum baseball bat. Or drop them in an above ground pool. Or both.Courtesy B TalDo you guys remember the South American crab-walking gnome? Of course you do. I posted about it this spring, after all. But a refresher may be in order—the Argentinean city of General Guemes was in some sort of panic earlier this year, because a shadowy, knee-high creature had been seen sidling around the town late at night. It may or may not have worn a pointy hat. Some local teens even caught the little creeper on video one night (much screaming was heard, but very few fine details could be made out on the crab-walker). While General Gueme’s citizens weren’t certain exactly what was stalking their streets, they knew one thing: they didn’t like it. And now it’s back (on video, again). See for yourself. This footage leaves me with two questions, neither of which are directly related to gnomes. Question 1: Is this even appropriate for a science blog? Isn’t this kind of pushing it? The answer, to both parts of question one, is “yes.” Of course it’s appropriate, because I said so. And it is indeed pushing things. But, if we didn’t push the boundaries of what we think is ridiculous now and again, think of all the stuff we’d miss. Crab walking gnomes would be out of the question altogether. And question 2: Why are Argentinean, trouble-making, teenage boys spending their nights waltzing with each other in the middle of the streets? Shouldn’t they be stealing things somewhere? Or practicing their vandalism? If they had to do some street waltzing, you wouldn’t think they’d want it on tape. This is the most questionable part of the video, as far as I’m concerned. So what do y’all think? Hijinks and shenanigans? Scary little gnome-sidler? And, if none of the above, what manner of person or creature is this? Must we turn the conversation to dwarfism? Or does anybody have a more creative suggestion? Now, in my last gnome-related post, I received some flak for my suggestion to use net-guns on the gnome. 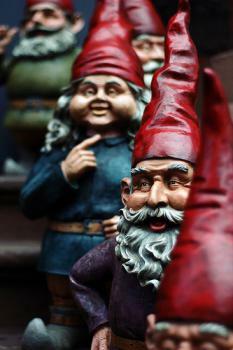 With that in mind, I am now revising my gnome-defense suggestions: cover General Guemes in glue traps. Then, when the craw-walker is captured, it will be easy to verify whether we’re dealing with a true gnome, or a run of the mill little person in a pointy hat. In the latter case, the person should be congratulated on their craftiness, and sent on their way. If it does turn out to be a gnome, however, or possibly a large crab in a pointy hat, then I say that citizens should have free reign with their, net guns, tazers, non-lethal deterrent sprays, etc. Whatever you can find around the house, really. The gnome, of course, won’t be going anywhere. The Yeti is in town again. Not our town, though. These are what snowy footprints look like: Just a visual reference for you.Courtesy EJP PhotoThere’s snow on the cryptocouch, y’all. How did it get there? I thought the cryptocouch was in a basement somewhere. (That’s what you say.) And that’s what I thought too. We were wrong. The cryptocouch, it seems, is very much a mobile entity. Sure, it lives in a basement, and that’s where we all (w’all) most often sit on it, but the cryptocouch also travels. It’s like that bed from the Nintendo Entertainment System’s Little Nemo: The Dream Master (Nemo! Help your cat, little man! )—the sucker flies. It flies. It has to fly, because how else could we explain the snow? See, the cryptocouch has just recently returned from the Himalayan kingdom of Nepal, where it was following a group of Japanese researchers on a mountaintop nearly five miles high. This particular peak, Dhaulagiri IV, happens to be where the Japanese team claims to have found traces of the legendary yeti. That’s right, y’all, yeti is in the house again already. He’s just not in your house. The primary goal of this expedition was to catch a yeti on film. 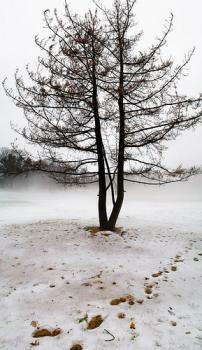 Photographs of the prints can be found at the link above, or at the team’s own site here. Don’t get all sassy if that link doesn’t work, though—you aren’t the only one who wants to see yeti footprints. If you can’t see the photos, or refuse to do anything that you’re told to do (I’m with you there, brother), here’s the deal: the footprints (or footprint, I’m not totally certain) were found in crusty snow on the mountain, and measure about 8 inches long. The leader of the team insists that they don’t belong to any of the other local animals, saying that his team has been coming to the region for years, and knows what bear, deer, wolf, and snow leopard prints look like; these prints look different. On a previous expedition, a team member thinks he caught a glimpse of the silhouette of a possible yeti. It was about 200 meters away, but he estimated its height at about 1.5 meters (slightly less than 5 feet). So this particular yeti doesn’t have all that imposing of a figure. Short yeti or no, we aren’t here to judge, are we? Well, we sort of are, but we aren’t handing out value judgments. We’re here to evaluate the evidence, and to decide if it’s likely that there’s a diminutive hairy man roaming the slopes of the Himalayas. The footprint isn’t quite doing it for me, but the couch saw fit to make the trip, so we’ll be sticking with the yeti for now. So get a load of this: goonch catfish in the Kali River, which separates India and Nepal, are rumored to have developed a taste for human flesh and some locals think that they are now targeting human swimmers as prey! Whoa! 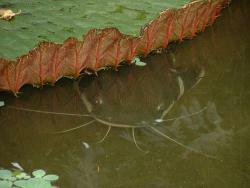 Bagarius yarrelli, or the goonch catfish, will commonly grow to a length of around 6 feet, and may weigh over 150 pounds. The story has it, however, that a particular goonch (or goonches) have grown exceptionally large off of a rich diet of partially burned human corpses thrown into the Kali River with the remains of funeral pyres. Not content with the charred leftovers of this nutritious delicacy, the goonch (or goonches) has been seeking out fresh meat. Isn’t that awesome? Mutant, man-eating catfish? Pretty sweet, especially if you don’t live by the Kali River. Heck, I’d say you could stop reading now, if you want. I’m just going to go over a couple other points, which I think are more or less incidental. Not. Worth. Considering. Everything is so cool as it is, why would you want any more? So. The mighty, carnivorous goonch… Mighty indeed is the goonch—the current world record holder comes in at 6 feet and 161 pounds, and this site claims that goonch weighing between 300 and 400 pounds can be observed in areas where fishing is not allowed (and, presumably, these are un-mutated specimens). “Carnivorous” is accurate too, although, well… generally B. yarrelli is thought to feed on aquatic insects, smaller fish, and prawns. To describe the huge catfish as “mutants” might be a little sensationalistic too. Technically, to be a mutant something has to have a new genetic characteristic. To the best of my knowledge, eating people shouldn’t actually cause your genes to change. Unless those people were radioactive, or something, but in that case you’d probably just get cancer, not grow really big. And there’s one other thing, one tiny little thing. I noticed that many of the websites for Kali River resorts and lodges (Bip, Boop, Bip) mention that large crocodiles can frequently be spotted in the water. But, you know, just because there are crocodiles around, and crocodiles have been known, on occasion, to pull people into the water and eat them, and people in this particular river have been pulled into the water and probably eaten… that doesn’t necessarily mean that crocodiles are responsible. Really, it could be anything. Like, maybe, mutant, man-eating catfish. The Cuero chupacabra bites back. Time to discuss, people. The Cuero Chupacabra: A photograph of the mystery animal itself. Gorgeous.Courtesy Phylis B. CanionThe Cuero Chupacabra lives! Well, not “lives” literally. It was, in fact, hit by a car, decapitated, and frozen, which makes living difficult for most things. But the tenacious crypto-beast refuses to be silent, even in death, and so I invite you all to have a seat on the cryptocouch, and kick up your feet on the ottoman of open-mindedness. Do so now. A quick refresher: Last year a Texas woman found several strange looking animals on a road near her ranch—all had apparently been struck by cars. 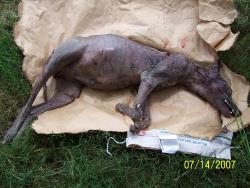 The creatures were about 40 pounds each, grayish, largely hairless, fanged, and dog-like. It was suggested that these animals might have been responsible for the deaths by exsanguination (removal of blood) of dozens of chickens in the area over the last several years, and so they were associated with the legendary Latin American bloodsucking monster the chupacabra. These kinds of claims are made all the time, but this lady actually had the foresight to keep the bodies—or at least their heads—in her freezer for tests. Refresher #2: A couple months later, the creature’s DNA results came back, and it was declared that the “chupacabras” were nothing more than coyotes with skin problems. Science Buzz had a post on this story too, and here’s the link for Texas State University’s take on the DNA results they came up with. And that’s about where coverage on the Cuero chupacabra dropped off (except for a sighting this summer). You state the Cuero Chupacabra is a sick coyote. Based on what evidence? I have the beast, I have the DNA, and I have talked to multitudes of scientist and biologist and not ONE person has stated that this animal is a sick coyote. I will continue to research this beast as I stated I would when I first began observing it two years ago!! And so today the cryptocouch is no longer a place of simple relaxation, it is a nexus of discussion! What do you all think? 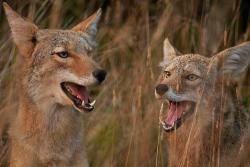 If it’s not a mythological creature, and it’s not exactly a coyote, what is it? Leave your comments and questions here. Hopefully Phylis will be joining the discussion herself—do you have any questions for her? **Here's a link to a photo of Phylis with the creature's head. As soon as I find a postable image, I'll put it up with the story. Buckle up for big Bigfoot news! Whoa! Whooaa! 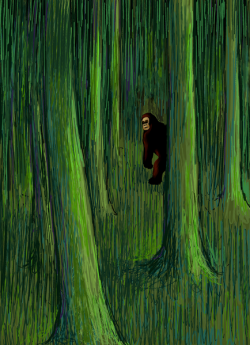 The illustrated Bigfoot: Quit screwing around with this drawing, and look at the article!Courtesy Jean-noHoly moly, Buzzketeers! I've barely gotten all the crumbs and stank off of the cryptocouch from yesterday, and yet I ask, no, I insist that y'all have a seat once again. Don't mind the crumbs—they're yours. Some folks in Georgia claim to have a Bigfoot body in their darn freezer! A bold claim, my southern friends, a bold claim, but they will supposedly be flying to California on Friday to hold a press conference with "Searching for Bigfoot Inc."
Word on the street says that these folks are lining up DNA tests, and that a molecular biologist, an anthropologist, a paleontologist and assorted other scientists will be examining the body over the next few months at "an undisclosed location," and carefully documenting their findings before public release. I'd normally recommend Loren Coleman's Cryptomundo.com for this sort of thing (he's usually the guy to turn to for reasonable responses to kind of crazy claims), but the site has been all crazy itself today. Maybe because people are so into Bigfoot. So click on the "Word on the street" link above. There might still be a goofy looking photo. "*The creature is seven feet seven inches tall. *DNA tests are currently being done and the current DNA and photo evidence will be presented at the press conference on Friday, August 15th." I'm inclined to think this is fake, but, hey, if nothing else, it's a delightfully elaborate prank, and I'm all about that. 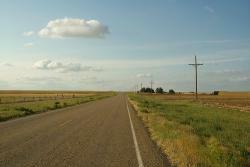 Just a road in Texas: No chupacabras, or ill coyotes, so just chill out. Watch the video, huh?Courtesy mtsrsA county sheriff's deputy-in-training in Texas got some footage of a strange, poochy animal, as she chased the creature down a rural road. Where in Texas? Cuero, naturally, where there was a stir-up last year about the one and only Chupacabra! Sit down, y'all, and check it out. Until I have footage of this guy draining the blood from a goat, I'm saying it's part of a population of creepy coyote hybrids (which I also like). Science is making my Yeti magic stronger. 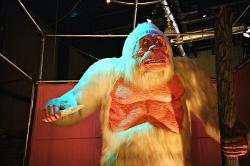 A yeti: preparing a powerful spell.Courtesy teotwawkiIt’s time again, Buzzketeers—get on the cryptocouch. Go on and sit down. Just as you are is fine. I understand that some of you may be a little crusty and gross, and that’s fine; you were probably just planning on getting a little internet on by yourself this morning, and maybe you let your crust build up, your funk get funkier, and didn’t expect to have to set yourself down on a cryptocouch with other Buzzketeers. Don’t sweat it. The cryptocouch is big enough for all of us, with room to spare for buffer zones, and it’s upholstered such that I can just hose it off later. And that may be necessary, if your orifices aren’t up for some serious cryptozoology this early in the day. And now you’re on the cryptocouch, despite your reservations. How did I ever convince you to do that? Hey, it’s only to be expected—my Yeti magic is particularly strong today. Usually my Yeti magic is fueled by groundless faith, but today, oh today, my Yeti magic is burning the high-octane gas of scientific uncertainty. Let’s slow down and use our words. Scientists at Oxford Brookes University, lead by “ape expert” Ian Redmond, have recently spent some time examining a couple of mysterious hairs from the Garo Hills of northeast India. The hairs were collected after a local forester reported seeing the region’s Yeti/Bigfoot thinger (specifically, the “Mande Barung”) in the area three days in a row. The hairs have been compared to samples collected by Sir Edmund Hilary, a mountaineer and explorer, who did some Yeti-searching in Nepal in the 60’s. And that’s cool, except Sir Edmund’s specimens have generally been agreed to be from a kind of antelope, something that Hilary himself was probably aware of. The Oxford Brookes researchers, then, began examining the new hairs “fully expecting them to come from a known animal.” The hairs, each less than two inches long, however, now appear to have come from an unknown animal. The scientists say that, under a microscope, the hairs look slightly human, slightly like an orangutan, and slightly like Hilary’s samples (so, slightly like antelope hair). 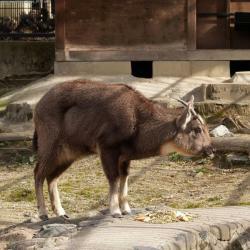 But they don’t look exactly like hair from a known animal, especially none that are known to live in the Garo Hills. So, even if the hairs don’t come from a Yeti (or whatever)m they may be evidence of a slightly more mundane new species. Which is pretty neat. The next step that will be taken with the hairs is their submission to that colossal buzz-kill we call genetic testing. The hairs, which still have follicle attached, will be sent to two separate laboratories in Oxford and Cardiff for DNA analysis. Even if the results don’t identify the hairs as belonging to a specific species, they should at least show what their original owner was related to (like a primate, or, say, a type of antelope). How about that? Powerful stuff, huh? So cast your Yeti spells while the news is still hot, because who knows what the DNA tests will bring us. Now get off the couch. I have to sleep there, and you’re making it all grimy.